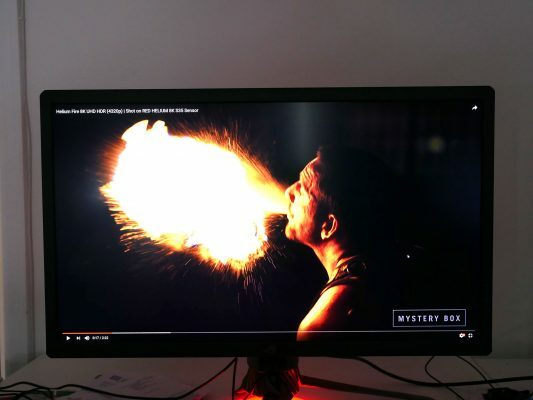 It has been nearly two years since we first heard about this monitor. Heir apparent to the gaming monitor throne, the Asus PG27UQ packs in just about every high-end monitor feature you could imagine. It has a 4k resolution, a 144hz refresh rate, it uses an IPS panel, it has g-sync and it can do true HDR thanks to 384 independently controlled backlight zones and true 10-bit colour processing. It’s a bonkers spec list and sure enough it comes with a bonkers price to match. 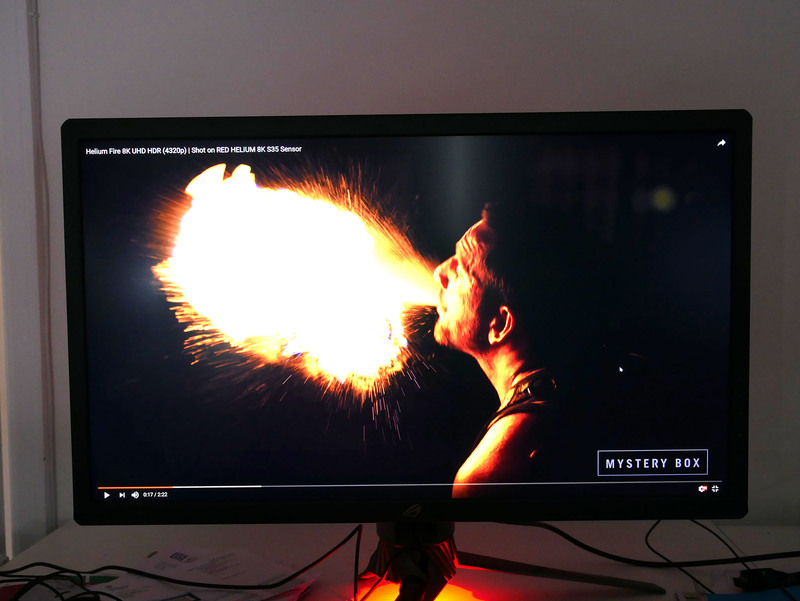 Can a 27-inch display really be worth $2300? Let’s find out. Starting, with the physical design and features, this display has all the hallmarks of a high-end Asus gaming monitor. You’ve got a fairly striking, angular design to the stand and back of the display, you’ve got the now signature copper highlight on the base and of course you’ve got lights. Oh so many lights. There’s the downlight we’ve seen on previous Asus models and this is now joined by an adjustable uplight that can be projected onto the wall behind or ceiling above. There’s also a little Asus ROG logo on the top of the stand and another bigger ROG logo on the back that does that funky effect of appearing reflective when the lights are off, then translucent when the lights are on. I’ll leave the overall styling judgement up to you, but certainly the up and down lights were far too distracting for my liking so were immediately turned off. Elsewhere you don’t get much in the way of extra features. The stand offers the usual height, rotation, tilt and pivot adjustment and it can be removed so that a monitor arm can be used instead. You also get a couple of USB 3.0 ports round the back, along with a headphone jack. However, there’s no headphone stand, side USB ports or speakers, and video connectivity is limited too. The use of G-Sync means you get just one display port 1.4 and one hdmi 2.0, so a hub for all your consoles and PCs, this display isn’t. The other thing to note is that this display is quite chunky. The sophisticated 384 zone backlight means the whole panel has to be quite thick and the bezel isn’t of the low-profile or hidden variety. So this isn’t a sleek, svelte statement of style. As for the onscreen display, it’s controlled by Asus’ usual combination of a mini joystick and four buttons. Tap the joystick and it opens the menu then you can push it up and down and left and right to navigate around. It works really well, though notably all the buttons are a bit looser than previous Asus displays we’ve used, which is a touch disappointing. The menus themselves are logically laid out, respond quickly and have all the options you should ever need. Two of the buttons on the back also bring up extra menus. The GameVisual menu provides various options for pre-configured, game optimised modes while the GamePlus menu provides options for a crosshair overlay, a timer, an FPS counter and a display alignment tool. None of these feels essential but some might come in useful on occasion. Looking back to the main menu, there are two settings that are of particular interest, the first of which is the Variable Backlight control. This switches the display from having each of its 384 backlight zones working independently to having them stay uniform. Why would you want this? Well, if you’re doing something like editing pictures or video, you want to ensure you have a uniform response from your monitor. In fact, for all general desktop work, I’d recommend keeping the variable backlight turned off. Then there’s the Display SDR Input option. This takes a standard, non HDR input signal and stretches it out to fill the larger colour gamut that the display uses for HDR. This serves no practical purpose but it does allow us to test whether the monitor delivers its claimed high colour gamut. As for HDR, this is turned on automatically when the display detects an HDR signal. You’ll also have to switch HDR mode on in Windows to enable this. Finally, then, we come to the display itself, and it’s almost difficult to know where to begin, there’s so much to talk about. So, let’s again just run through what we have here. The LCD is a brand new panel made by AU Optronics and it has a native 4K resolution and maximum refresh rate of 144Hz. This is a first for any 4K display and is also something that has only been made possible by the use of DisplayPort 1.4. 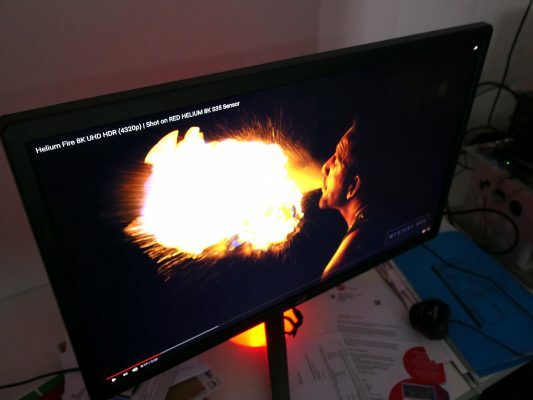 Note, there are some limitations on that maximum 144Hz refresh rate. For a start, this is only the overclocked rate, with 120Hz being the default. Also, if you enable HDR, the display will only deliver true 10-bit colour at up to 98Hz. These are hardly major problems, but worth noting. Behind the LCD panel sits an array of 384 LEDs that can be controlled independently in order to create a greater contrast between the brightest and darkest parts of an image. Typical LCDs only have a contrast of around 1000:1 whereas HDR aims for 10,000:1, so the LCD needs a variable backlight in order to get close to this. The likes of the Samsung CHG90 also had a variable backlight but it only had 6 zones. The step up to 384 is what makes this display so expensive and what makes its HDR so much more compelling. HDR isn’t just about contrast, though. It also has an extended colour range. Now, HDR standards vary but in essence, while normal video, games and displays stick to the sRGB colour gamut, HDR expands this to 90% of the larger DCI-P3 colour gamut. This is achieved here by the use of quantum dot colour filters for the red green and blue sub pixels, instead of more conventional coloured filters. Thankfully, for non HDR stuff, the colour gamut of the display can be turned down to normal sRGB levels. So that’s all the technical stuff out the way but of course the question is how does the display perform? And as you might expect, it’s pretty impressive. Switching off the variable backlight, extended colour gamut and HDR and we just have a very good quality 27-inch IPS display. It has good viewing angles, colour reproduction is excellent, the uniformity of the display is decent, and you get a native contrast ratio of 1100:1, which is about as high as IPS LCD displays go. So, for all your normal day to day desktop work this display is just about as good as any other top quality 27-inch monitor. Except of course, here you get a 4K resolution, which comes with its pros and cons. The pros are fairly obvious, in that everything looks amazingly sharp, from video and images, to games and even the thumbnails you’ll see on sites like YouTube. Fire up a high quality 4K video, in particular, and the incredible amount of detail brings an almost 3D like depth to the image. However, the downsides are that with this being only a 27inch display you’ll have to use Windows scaling to make things a readable size, which in turn means you don’t get a larger desktop area than any other 27inch monitor. Plus, Windows can still sometimes mess up the scaling and, when gaming, if you’re not able to get good enough performance at 4K and have to drop the resolution, it looks worse than running a game at the native resolution of a lower resolution screen. As such, it really depends what your priorities are and how you tend to use your PC, as to whether the 4K will be of benefit here. To a certain extent the same can be said of HDR, as of course, it only works with HDR content, which isn’t exactly commonplace. Video support is reasonable, though not always easy to access from a PC, but there are still very few games that support it, with no great commitment from publishers to ramp up that support. Nonetheless, when you do get to experience it, the results are amazing. The huge leap in contrast adds so much dynamism to video and games. Explosions leap from the screen while the inky blackness of night or the darker depths of a dungeon aren’t spoiled by the greyness of a normal LCD backlight. Meanwhile, the extended colour range of HDR, while often slightly more subtle, can really shine in certain instances too. Watching the dazzling green of foliage on a bright sunny day and it makes you realise what conventional video has been lacking all this time. What’s more, you still get much of the benefits of HDR in normal non-HDR content just by having the variable backlight on. Black bars above and below video are actually black rather than grey and just generally you get more of that depth. However, the one thing to note is that this display can’t really do justice things like stars or fireworks against a night sky. Even with 384 of them the backlight zones are still too large to have the granularity required to pick out all those tiny points of light. Overall, then, the PG27UQ is an interesting beast. On one level, it absolutely lives up to the hype in terms of being the single best 27inch gaming monitor you can buy. The combination of 4K and HDR looks amazing while core image quality is fantastic and gaming performance is right up there as well. It’s just that for such a high price it feels like a bit of a jack of all trades and master of none. 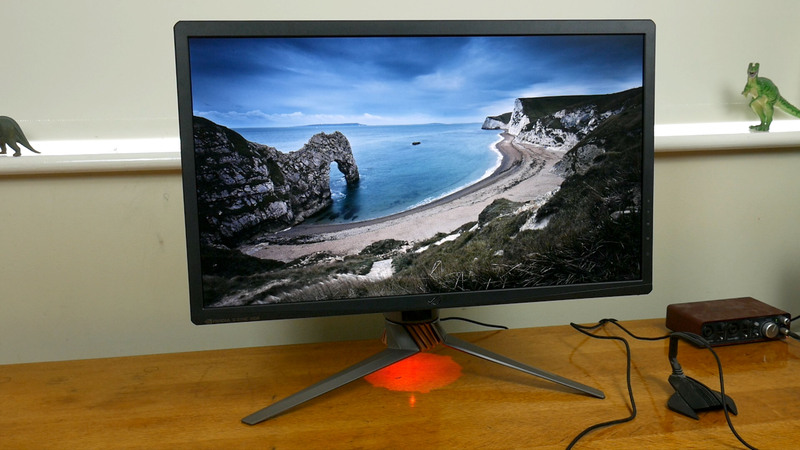 Sure, it’s the master of HDR for any gaming monitor right now but, for instance, if you’re after the ultimate competitive gaming monitor, far cheaper, lower resolution monitors technically out perform it. Meanwhile 4K feels somewhat superfluous on such a relatively small display. 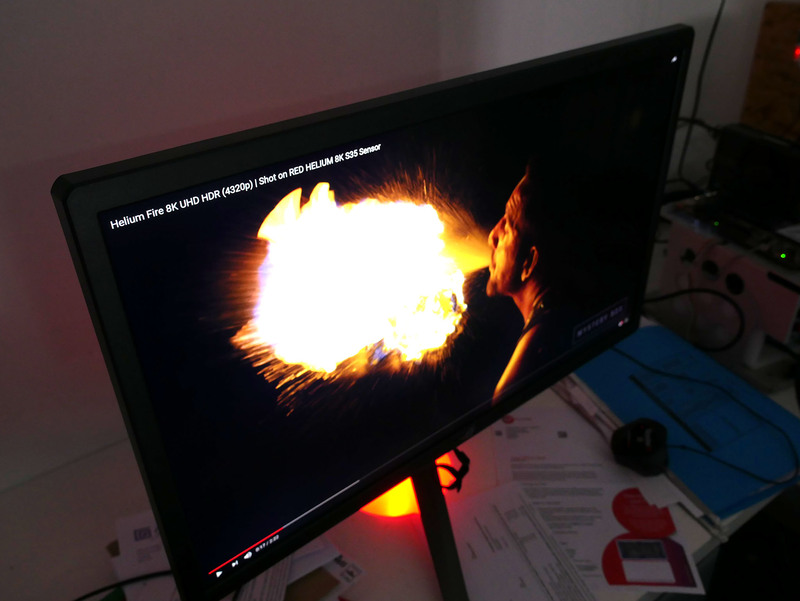 Indeed larger, and particularly ultrawide displays seem like a much more natural fit for watching HDR video and providing that really immersive HDR gaming experience. Plus most larger displays get you a bigger desktop area. As such, it strikes me that a far more compelling debut for such high-end HDR should have been with an upgrade to the 34in ultrawide, PG348Q. Just add HDR, without even upping the resolution or refresh rate and you’ve got a really compelling proposition. So, if you’ve got the money, the PG27UQ certainly won’t disappoint, but somehow it doesn’t quite feel like the aspirational upgrade that the likes of the PG279Q or PG348Q were before. All images below have been edited to slightly exagerate the effects I’m trying to highlight. …but it’s a big improvement over the generally greyer dark parts with variable backlight turned off. Also note the slight backlight bleed in the top right corner.